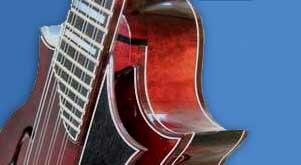 JazzMando.com | Broadening the mandolin to Jazz, Pop, Cerebral Folk, and Contemporary Praise Music. FFcP: An exclusive and revolutionary new way to access the entire mandolin fretboard. Start with Lesson One and move on to some more advanced techniques! Webtracks: Extended audio support for Mel Bay's "Getting Into Jazz Mandolin" book. Includes free MP3 'jamtrack' accompaniment files and more performance material we couldn't fit on the CD!